Art gallery of emotions for cosmetic make-up. Cosmetic make-up is high art or lofty style if visagistes and facial stylists, and in essence visual artists see emotional expressions of female faces and do not mask emotions, but create physiognomic images which do not contradict moods of women. 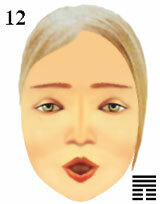 Quiet eyebrows and open mouth seem happy as eyes express joyful emotions. Quiet eyebrows and joyful eyes seem frank as mouth expresses open emotions. Joyful eyes and open mouth seem calm as eyebrows express quiet emotions. Pleasure of the person is not realized by mind, and expression of feelings does not disturb silent ideas. Desires are frankly shown in feelings of the person, but ideas hide personal aspirations. facial art for cosmetic make-up artists.